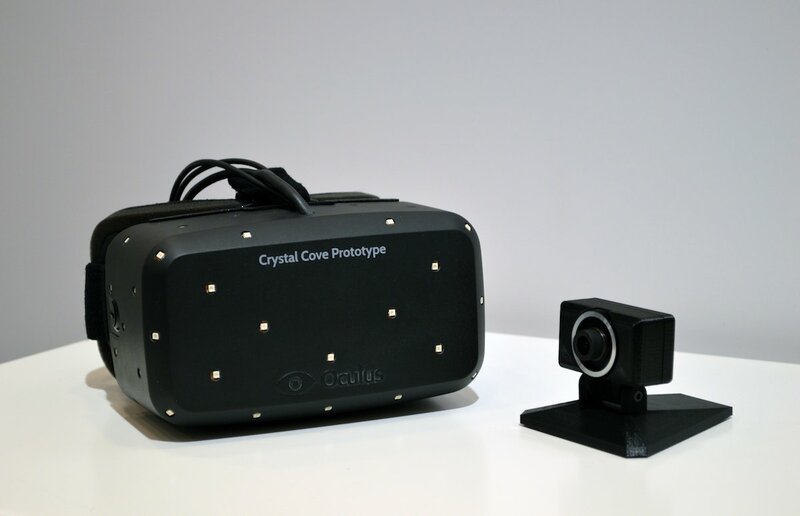 With the latest version of OR, dubbed “Crystal Cove,” a motion camera is mounted separately to track torso position—which means that movements of the body that also affect head position can also be tracked and translated to the device’s two tiny screens—one in front of each eye—and rendered at an impressive 1080p. Given its high-resolution display and multiple technological strategies for tracking head movement, OR dramatically alters the act of looking as a screen-based/planar experience given depth by linear perspective (or Z axis). Instead, real vision is matched by simulated, 3D vision, and one observes space and its objects much like their real counterparts—by moving the head for multiple angles of view, and by focusing to select an object out of the visual field for further inspection. How this illusion is achieved depends on both the science of motion-tracking and display technologies, as well as on the art in their application. I had a chance to hear a lecture at UCLA (2/4/14) from Steven LaValle, chief scientist for Oculus Rift. LaValle divided the discussion of OR’s development into three inter-related areas, including sensor characterization (defining and programming the gyroscopes, accelerometers and other tracking systems) and filtering (fusing or synthesizing the tracking inputs). But LaValle said the biggest challenge—and area of research—for OR development is perceptual psychology and the science of human vision. Perhaps the most classic and illustrative problem of translating the gestalt of human vision into VR is what’s known as simulation “sickness.” The headaches and nausea induced by simulation often result from what is called an ocular-vestibular mismatch—a disconnect between the visual and spatial alignment data provided by our body’s “sensors,” between what our eyes see and what our bodies feel by way of spatial orientation, courtesy of the ear’s vestibular nerve (which senses gravity and head movements). Many other problems also attend VR development (screen brightness, resolution and refresh rates (very important when close to the eyes), blurring and warping, etc. ), but in my experience, OR perpetuates a persuasive, headache-free VR experience for looking in a nearly spherical, 360-degree range of motion. While the current state of motion-tracking and display technologies makes everyday VR a near “real” reality, it’s the art of VR interface design I find most intriguing. As LaValle explained, the use of predictive tracking algorithms, for example, can now successfully correlate precise, minute movements of the head with real-time adjustments in the display with almost no perceptible lag. But as LaValle’s team discovered, the net result was, perversely, too much input. Every micro-movement of the head—movements we don’t notice in human perception—resulted in noticeably twitchy corrections in the display field. LaValle’s team eventually decided to de-tune their predictive tracking model as an interpretive intervention to deliver a more “natural” replication of human vision. media coverage. 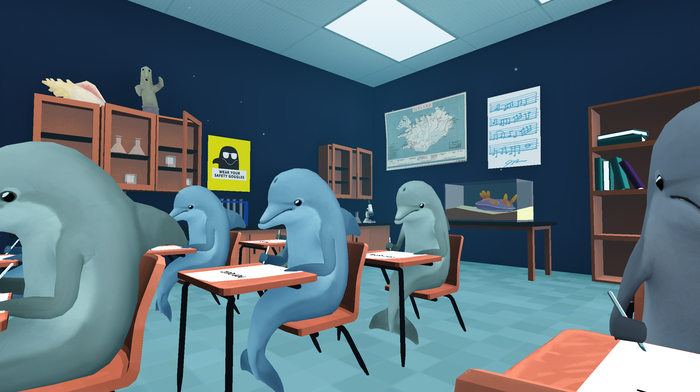 Set in an underwater classroom of dolphins, the player has to cheat off the exams of other “students” by turning, looking, and leaning without being caught by the teacher. I found myself turning completely around to cheat off the paper behind me, simply because the sensation of so much bodily movement through the torso and head in a virtual environment is so satisfying (getting caught by the teacher be damned). As many designers have already discovered, OR can be combined with over-the-ear headphones to create a powerful audio-visual sensorium. A case in point is a public art installation by new media artist and UCLA graduate David Leonard: a haunting, multi-media memorial to River Phoenix’s death outside The Viper Room on the Sunset Strip 20 years ago. By adding a camera to OR’s head-mounted display, Leonard brings a real location back into the VR experience. To “see” the art work, viewers don the camera and OR head-set, and then look at a QR tag placed on the sidewalk outside the club. The encoded image displays in the device as a positionally responsive, site-specific image of Phoenix lying on the sidewalk. The accompanying headphones convey the commotion outside the club that night as Joaquin Phoenix places a 911 call for help (a video re-creation of the installation can be viewed here). Leonard juxtaposes the immediacy of that horrible moment with the hypermediacy of its aftermath—the onslaught of media coverage (magazine covers, TV news stories, pundit commentaries, film clips, etc.) that ensued. The overall effect is like a multi-media museum piece, made all the more difficult in its interpretation—and impactful in emotional effect—by being in the actual location where Phoenix died. These two examples illustrate—from the comedic to the chilling—the range OR possesses for “mobile” vision or, more precisely, for the screen as a simulated space to envelop the body. (See VR Cinema as a fascinating example of remediating cinema’s theater-going experience into an OR one.) The expressive possibilities—and cultural and media consequences—for OR seem limitless. For example, thinking about OR in a cyberpunk vein, one can imagine the dark scenarios that await the use of OR and headphones combined with psychoactive drugs. Whether employed for terrorist interrogations or recreational tripping, OR-based freak outs seem just around the corner. More prosaically, as beings who rotate, tilt, and pan our camera-like heads to better see the world, we require of our VR experiences a successful interface that replicates how vision and spatial orientation are the compass of the body. This is OR’s raison d’etre. But what about the rest of the body, and the body parts that do things independent of vision, or in concert with it? Here is where OR creates an aquarium effect for me different from the one intended in Classroom Aquatic. Wearing the device, I feel immersed from the neck up (perhaps the torso, too, gets a little wet as a supporting mechanism for head positioning), but I’m only “submerged” in the virtual space as much as my head as a “moving camera” will allow. We can’t blame OR for this, per se: it’s trying to solve head-position problems, which are challenging enough. While OR out of the box is at its best when both physical and virtual bodies are essentially confined to a swiveling chair, all sorts of third-party attachments and experimental enhancements are possible to restore aspects of embodied agency (see OVR Vision, which combines camera-mediated “real” vision with VR vision through a 3D camera attachment to OR). But perhaps more importantly, OR may stimulate new genres of videogaming and interactive viewing that are less “tool”-based or motivated by picaresque narratives and their spatially inclined navigations. Perhaps visual interfaces alone will enable manipulation of virtual environments; game design in the future may give us more adventures in smaller spaces, exquisitely detailed and revealing of their secrets only through intense visual exploration. Visual and verbal communication may become core mechanics in the future, perhaps shifting the very concept of videogame play toward modes that are more collaborative and conversational, rather than predicated on hand-eye coordination. Regardless of the challenges in store for video games and other interactive media, the implications of OR for VR will be exciting to follow in the years ahead. As Marshall McLuhan and Don Ihde (among others) have attested, our media tools—our interfaces—are not only extensions of ourselves, but also alterations to the phenomena of reality as a lived experience. Just as vision is a privileged human sense, tools and interfaces for vision remain the principal target for VR experience. But what kinds of worlds will these be? So full of sight and sound, but so desolate to the touch? The larger cultural question of what we want from VR—and its consequences for plain old R—remains a tantalizing mystery.